OnlyFactoryDirect.com launches the largest Technical Pro Sales Event of the year with 10%-25% off Technical Pro speakers amplifiers, and pro audio equipment. The sale will highlight some of Technical Pro's most sought after equipment like, 15% off Technical Pro's rack mount power supply with 5v USB charging ports, the PS9U. Since its inception, Technical Pro has become a leader in DJ & home audio manufacturing. Driven by a passion for sound, their mission is to establish new standards of reliability and performance with an uncompromising approach to audio design. The result is a product line that offers an unrivaled assortment of professional audio equipment featuring newer hybrid technology and digital amplification. Few audio manufacturers have kept up with the digital revolution of mp3’s, tablets, and digital audio files, but Technical Pro has embraced the latest technology and built it in to their products from design to shelf. Technical Pro's Hybrid Series of integrated amplifiers offer a ton of power and features such as pre-amp, SD and USB inputs, mp3 player connections, and Bluetooth compatibility, while remaining extremely affordable. Sale items to also inlcude; Technical Pro speakers like the PVRTX powered speakers, VRTX passive loudspeakers, studio monitors, power amplifiers, signal processors, and more. The technical team at OnlyFactoryDirect.com took the most popular Technical Pro speakers and amplifiers and paired them with the proper cables, stands, and accessories, to create bundled packages to save buyers money. Receiving awards for their outstanding customer service, OnlyFactoryDirect.com also promises to deliver the lowest prices on Technical Pro products. Founded in 2004, OnlyFactoryDirect.com is an on-line resource for audio equipment at factory direct prices. OnlyFactoryDirect.com offers over 3,000 audio related products from well known brand names like JBL and Mackie to emerging new brands like Technical Pro and Podium Pro Audio. OnlyFactoryDirect.com offers free ground shipping on all orders within the continental United States and a 30-day “No Hassle” guarantee. If you are not fully satisfied with your new guitar cabinet, OFD will pay the return shipping and give you a full refund (see details). Alto's Latest iPA System Says Get Your Karaoke On! I would like to dedicate this post to my friend Monika Ficcaglia , whom may have been the inspiration behind this brilliant traveling party speaker. The lovely and beautiful, innocent appearing woman, that receives love notes from her "tired" neighbors, asking her to please turn down the karaoke at night. The Alto iPA Music System Powered 10" Speaker aka party bus, is literally an event waiting to happen. It's unique iPad docking station in the rear screams, karaoke party! Let's not put it into a box with limitations, because it simply abounds with possibilities! The iPA Music System from Alto Professional is a powerful, portable loudspeaker with 400 Watts of power for amplifying your iPad apps, cranking up your iTunes library and singing karaoke like never before. Simply load your iPad into the iPA Music System dock, run your app of choice and crank up the volume. Alto uses a powerful internal amplifier to fill you club, event, or worship center with clear high fidelity sound. With an included Alto Professional ADM10 cardioid microphone and 10' cable, you're ready to throw unforgettable karaoke parties, add audio to video, or dance to your favorite song list, while learning new moves on your iPad. Add an additional speaker to expand your iPA Music system and play your iPad in stereo. Dock your iPad and rock the party with the iPA Music System from Alto Professional. Absolutely, one of the best deals of the year. 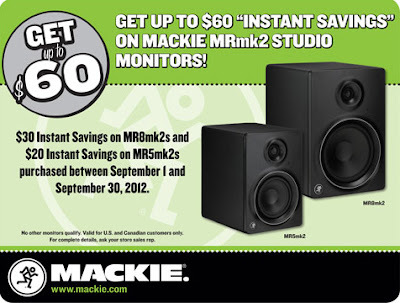 Highly rated Mackie Studio Monitors with instant savings!! When your studio is ready to go pro, you want a reference monitor that translates in all environments, holds up under all conditions, and isn’t painted up like a school bus. You want an investment that sounds both amazing and amazingly flat, so you don’t end up second guessing your mixes into infinity. You also want monitors you can turn up, because not every artist is “satisfied” listening to their ear-shredding guitar solos or thunderous bass tones at “nominal volumes”. And you want all of this at the right price. MRmk2 Series Studio Monitors are all that and more. With unbelievable power, performance and clarity MRmk2 Series Studio Monitors stand alone in their class. Founded in 1924, Celestion has grown to become one of the worlds largest and most innovative manufacturers of loudspeakers and can now be found in Studio 7's stunning new guitar cabinets. Celestion was responsible for the first ever dedicated guitar speaker and have since developed into the one of the most recognizable names in drivers. "It's like the Olympics of guitar cabinets, you have this bright young beautifully constructed Studio 7 cabinet and inside you find a speaker that is associated with some of music's most memorable performances like Hendrix and Slash," smiles Mike Lewis President of OnlyFactoryDirect.com, "and together it's gold." Seemingly twice as loud as anything else at the same power level, the Vintage 30 handles massive overdrive sounds with ease. The vintage 30 handles extra heat when operating with higher power equipment, designed with a new coil assembly and modern materials, complimenting the powerful tube amplifiers Studio 7 is known for producing. Tight bass, fat mids and a smooth, yet harmonically rich top end have made the Vintage 30 an excellent 4 x 12 or 2 x 12 loudspeaker. The new Studio 7 guitar cabinets are available in a variety of combinations, the S7212C a 2 x 12 cabinet, and S7412C a 4 x 12 model cabinet stands out providing exquisite tonal variations for players of any musical style. Both models feature low-resonance wooden enclosures covered by a uniquely designed tough tolex cover and high density grill cloth sporting classic styling with a rock'n'roll edge. The Studio 7 S212C and S7412C deliver enormously detailed, complex overtones, with that vintage crunch and are available exclusively at OnlyFactoryDirect.com. Founded in 2004, OnlyFactoryDirect.com is an on-line resource for audio equipment at factory direct prices. OnlyFactoryDirect.com offers over 3,000 audio related products from well known brand names like JBL and Mackie to emerging new brands like Studio 7 and Inspired Instruments (You Rock Guitar). OnlyFactoryDirect.com offers free ground shipping on all orders within the continental United States and a 30-day "No Hassle" guarantee. If you are not fully satisfied with your new guitar cabinet, OFD will pay the return shipping and give you a full refund (see details). We have had several novis DJ's and band members call, needing assistance setting up their new mixer and understanding how to utilize all the features it has to offer. Technician Scott has created a short helpful video understanding all the ins and outs of the MX602 6-channel mixer and the MX1204 12-channel mixer. OnlyFactoryDirect.com's ESP Guitar Giveaway!! It's so easy to win. "Like" OnlyFactoryDirect on facebook to be eligible for a chance to win a new ESP Electric Guitar. Visit OnlyFactoryDirect.com for more details or click image. 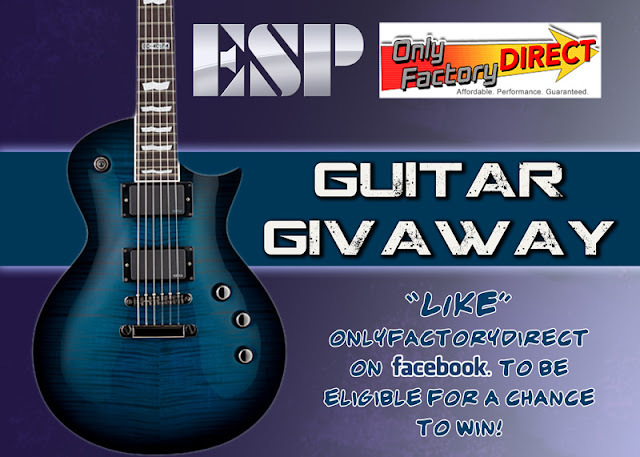 OnlyFactoryDirect.com launched a new campaign to grow their facebook fan base by offering an ESP EC401 FM Ltd Electric Guitar. The popular model has received excellent reviews and gained ESP notable respect from the guitar community. The ESP EC-401 FM Electric guitar is basically a modern / metal oriented take on the traditional LP style guitar. Excellent for rocking metal, classic, blues, or grunge with crushingly powerful tone. Beautifully constructed and versatile, the ESP EC401FM has a thin U-shaped neck contour; 24 extra jumbo frets make the LTD EC-401FM an extremely playable electric guitar. Loaded with active EMG-81 (bridge position) and 60 (neck position) pickups, this electric guitar has plenty of gain and tonal articulation. The EMGs on the EC-401 sound awesome and make lead and rhythm parts shine. ESP designed this electric guitar with a Mahogany body and neck, Rosewood Fingerboard, and Flamed Maple top. It has a thin U neck contour with black nickel hardware and Grover tuner. The finish is a black aqua sunburst which gives it a vibrant rich look. The ESP EC-401FM is definitely a guitar you can grow with. loading his Mackie systems into a C-17 military jet for a USO tour in the Middle East. As Goforth points out, “portability” takes on a different perspective on military tours. 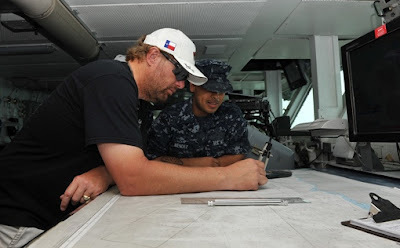 one or two smaller forward operating bases,” says Goforth.